The new church calendar year begins on September 1 and ends on August 31. 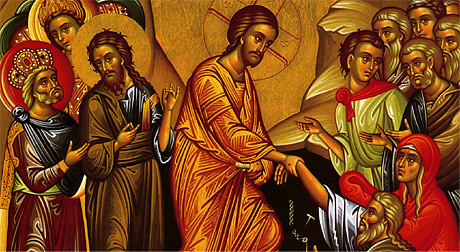 When Holy Days of Obligation, such as: Ascension, Sts Peter and Paul (Jun 29), and Dormition (Aug 15), occur on a weekday, then: Vigil of Feast (evening before) 7:00 PM • Feast Day (morning of) 9:30 AM. SEE NOTE ABOVE REGARDING SPECIAL SCHEDULE IN 2016 FOR DORMITION. Holy Days of Obligation, such as: Christmas (Dec 25), Theophany (Jan 6) and Annunciation (Mar 25) have differing schedules from year to year, as do all other feast days: please see weekly church bulletin. If it is to expected that we will have less than 20 people at a service then the chances are good that the service will be served in OUR CHAPEL with its entrance off of East Carson Street - across from our parking lot - which is dedicated to the Mother of God in the Feast of her Protection (which is celebrated every year on October 1). June 24: Nativity of St. John the Baptizer. On the nearest Sunday, we gather in the Church Hall for a pot luck luncheon.